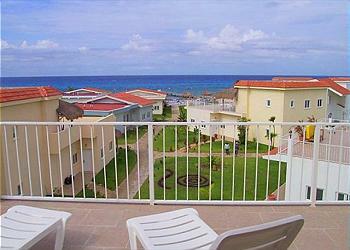 Residencias Reef 8180 Two Bedroom - Residencias Reef 8180 San Francisco Beach Priced right! Residencias Reef 8180 San Francisco Beach Priced right! (plus fees) For exact rates please put in your dates of travel and number of guests! Building 4 - 8180 TWO BEDROOM UNIT: The Residencias Reef Condominiums on Cozumel are located right on San Francisco Beach, the most beautiful beach on Cozumel. Just a 5 minute boat ride to some of the greatest reefs, it's perfect for beachcombers. There's also good snorkeling just off the beach. And that beach stretches on for miles and miles so you can run or jog for as long and as far as you like. All the Residencias Reef Condominiums are fully air conditioned, maid service, and access to two large heated freshwater pools! 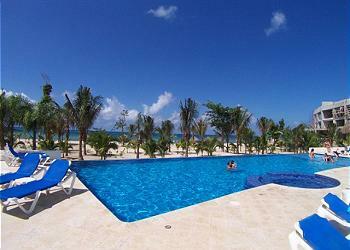 The condos are located about 9 miles south of Cozumel's only town, San Miguel. This unit is up one flight of stairs and down another. Once inside you are located on BEACH level. This unit has a private patio. SEE SISTER CONDO # 8170" BOTH CONDOS CAN BE RENTED TOGETHER TO MAKE A 3 BEDROOM CONDO FOR GROUPS OF UP TO 10 GUESTS. It was a very calm location and access to the beach and pool was only a few steps away. The only thing that got broken was in the last day an air condition system began to leak, but nothing serious. Overall the price / value is absolutely great. We had a great time. Also a nice place for kids. 3 of us stayed here for 8 nights. The condo is very well-equipped and conveniently situated. I am a scuba diver so appreciated the proximity to the jetty where the boats pick up the divers. My wife and her sister are not divers but they enjoyed the pool and beach. My only (small) gripe was that the wifi went out twice during our stay, but that was an issue with the wifi service provider, not the condo modem. Ishmael from ATIC provided excellent service. Excellent. Perfect location for families with small children. The location and set up was fantastic and the condo was pretty. There were basics in the kitchen (pots/pans/dishware etc.) Linens were fine. Internet did not work most of the stay which was difficult since we planned on this for our business. It would connect then disconnect constantly. The master bed was ok but the second one was very uncomfortable. Also there was nothing basic in the kitchen like oil, pan spray, salt/pepper etc so make sure to get it all. The Condo setting was quiet, private and peaceful with other nice renters from divers, to families, to nice couples. Condo itself is spacious and functional with a nice kitchen. Great breezes as corner unit allows two patio doors to slide open. Had an active and restful week. Condo was monitored by friendly staff. I rented a car to gain access to town for dinner and to tour the island. Jogging was easy along the one-way access road that parallels the only highway. Diving with Dive House and Water sports with Dive Plancar was also easily accessed. Clean, modern, comfortable, great spot for divers. Very nice condo. Close proximity to the boat dock - especially good for divers. Spacious and clean, strong showers were awesome. All the necessities provided such as large clean towels, soap, etc. The air conditioning system was a little noisy in the living area and one leaked a bit in a bedroom but they overall worked well. No light over the stove which was a little difficult at times but I didn't cook much. TV wasn't hooked up in one bedroom. Good condo for the price. Very nice and comfortable. Perfect for diving as the pier is very close. We were pleasantly surprised when we walked into to this condo.Very spacious ground floor corner unit and well appointed. We would stay here again. off the patio step there is a thorny bush that needs to be trimmed, also the dirt at the bottom of the step could use a couple pavers to walk on so dirt doesn't get tracked in. But we love it here,staff is great. Very Nice. Good location. Dive shops will pick you up at a pier that is 200 yards from condo. Clean, Air conditioned, friendly....what more could a person want? Stayed for a week with our young baby. Perfect location with beach and pool only steps away! Never felt crowded, very peaceful place. Condo is in fine condition, cleaned everyday, no complaints. Would return for sure! A time well spent, I place I would gladly return to again! The unit was very good. We enjoyed it! A kitchen could be better stocked. We read online that the kitchen was poorly stocked and the knives were dull. So, we brought our own set of knives, which turned out to be a good decision. We could not use any of the property's knives. It would be nice to have a tea pot, an obvious missing item. The matresses were of very poor quality. We were actually surprised that such a nice property would fail to invest in quality matress. A matress would be sach a small expece, but would make a world of difference for the owner or the guest. It was very nice to have a phone in the room. The TV was a plus. The maid service was prompt and efficient. Thank you. The staff was always curtious and eager to help. We did enjoy our stay and would gladly return to this property, given the opportunity. Thank you! We really enjoyed our stay at Residencias Reef. The condo was clean, and other than the hard bed, was very comfortable. Orlando and Esther took very good care of all of our needs. The pool and beach was perfect. It was a fair distance from town but cabs were readily available and we rented a vehicle for a day. The snorkeling off the beach wasn't very good this year but we were told by other guests that it was usually better. I would definitely stay here again! overall our stay was very good. when we arrived the condo very moldy smelling. we had to buy air fresheners to get rid of the smell. the condo was clean and everything worked. the dishes were old and a lot of them were cracked which can be a major health hazard, we could not use them. the knives were rusted and old, this was shown to the manager Orlando. the pots and pans were old and very meager. we knew some of this based on reviews we had read so we brought our own chef knife and frying pan and managed pretty well as i(Jose) cook alot. shopping in town was very good and ingrdients purchased there were excellent. the patio furniture was basically unusable and was shown to Orlando. he managed to get some better furniture for us. the owner should take more pride in his or her property and update things on a regular basis, especially the mold smell. that smell was in all suit cases and clothing when we got back home. the grounds and pools were excellent. the staff here were amazing, from the security who would remember us after the first day( amazing )to our very hard working maid Estre and the manager (Orlando) who checked on us regularly and aided us in rentals etc. this young man is going places. we would recommend this place to stay, but hope the owner does some upgrading. we would definately come back here. one more thing, this complex should at least set up a central bar b que that all could use. this also makes a good place for people to meet. a special thanks to Orlando. The place is spotless and modern. Maid service is great. It's not a party location but there is a dive outfit right on the beach (not associated with Condos). They will set you up for your dive package. Carry/clean your gear daily (they do expect a tip for the service). The one and only thing I didn't like was the sheets on the bed. They were rough and uncomfortable compared to what I'm used to at home. The bed was also a bit short. So if you're very tall your feet will hang out. Overall it was fine. The knives need to be sharpened. The TV in the bedroom did not work. These were minor issues. I would gladly stay there again. We had an excellent stay at the Residencias Reef and unit 8180. Our housekeeper was delightful and very accomodating. This is a nice and quiet unit and well set up for two couples. The unit had internet, but was not wireless. The TV's shown in each bedroom are not hooked up to cable or satellite so only the set in the Family area was usable. The latter was not a big deal as we were there for diving, the beach, and warm weather break from the northern winter climates. Arrival to Residencias Reef was a great experience. The cab ride to the condo was around $15.00 us. Once arrived was let in by a very friendly guard and got help with a rental car from next door at the resort. $44.00 per day. Our room had problems with the air conditioner and the manager camer to the condo that evening to move us to another room. It was beautiful!!! He had alot of great suggestions for my trip and made sure we were very comfortable. The grounds, pools, beach, staff and other residents are amazing!!! 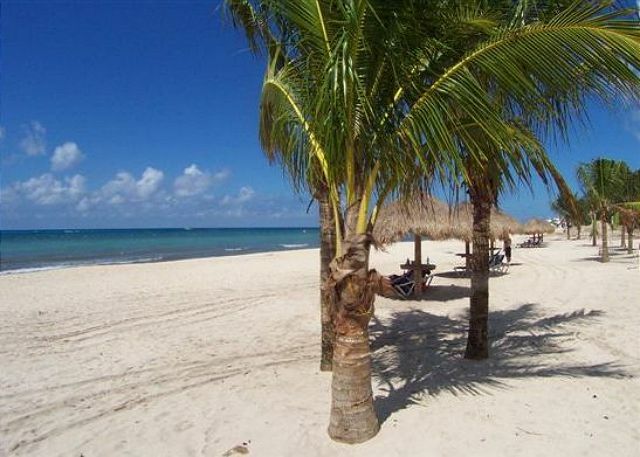 I will definately be back on my next visit to beautiful Cozumel! We never did figure out ow to work the dvd player. Also it was not possible to access allthe tv channels-it would be nice to have instructions for these things. We also had trouble making local phone calls. There was tv noise from the condo next door late at night which Javier helped us with. Quiet and away from the circus that the cruise ships bring to town. Beach 50 yards from the villas. If you want entertainment, Carlos and Charlies is a short walk down the beach. Very clean villa and the grounds are well maintained. A great place to spend a few days in Cozumel. Residencias Reef is a great development but this unit is neglected. Great location,great property. This unit is nice, clean overall and was convenient to the beach and pool. I recommend this unit but I do have a few complaints. There are no sharp knives. Bring your own can opener cause the one there is worthless. Bring a cheese grater. Terrible pans. Tiny coffee cups, no mugs. Dishwasher, but be sure to bring your own dishwasher detergent. The red couches you see in the pictures are disgustingly dirty. I suggest to immediately cover them with a sheet. The air conditioner in 1 bedroom is always on and the air conditioner in the other bedroom is always off. Their are no controls on the units to turn them on or off, and the remote controls are no where to be found. Plan on spending some time plunging the toilets. The beds are slightly better than sleeping on a board. We really did enjoy staying here, but these are things we had to "put up with". Not huge issues, but I feel it is only right that they are disclosed so you know what you are getting into. The condo could have used some better outside lawn chairs, but other than that it was paradise! would suggest a way to lock rear doors to access pools & beach more securely, how 'bout a cutting board, (sharp) knives, coffee mugs, cheese grater and garlic press for the kitchen?? Overall we are very happy with the property we rented. There were a few minor things we thought were odd, such as sheets that seemed a bit old -- tiny holes, but they were clean. All of the staff, especially the maid, were friendly and helpful. We would rent here again. Great place to stay, everything was wonderful. We had a wonderful time at the Residencias Reef # 8180. The facility is very nice and well kept. This specific condo was nicely furnished and comfortable. The management staff was helpful and easy to contact when we needed them. We met other people at the pool who have been coming back to stay at these condos for over four years. It is someplace we would come back to and recommend to others. Nice and quiet. Great location. The only improvements would be to have a cutting board and sharpen the knives. $3 dive boat pick up fee daily from the dock next door. My family and I stayed in this unit for approximately two weeks and it was a lot of fun and worth it. The cost of the unit is fair and overall it was comfortable. I would recommend this unit. - should have lock/key for sliding glass door to go to the beach without having to exit to the parking lock to lock up. - need a few things in the kitchen: a decent can-opener, sugar packets would be nice. Ther were 4 of us in a 2 bedroom unit. Pleny of room for all of us. the security staff and manager on site were very friendly and helpful when asked. The grounds and pools were kept very clean and the beach was great. Within walking distance to the Wyndem resort as well as a couple of beach resteraunts and plenty of activities ie parasailing, jet boats, bannana boats, mini sailboats. The scuba diving from here is awesome. Lots of choices and pickup on the beach dock. The weather was a little warm but the water was great and so was the location of our condo. Everythng was top notch. We had a blast and will do it again. The staff of "at home in Cozumel" were great. Great facility - clean, well appointed. Would be nice of all TVs had worked. Overall very pleased with value for the money. Beautiful, well maintained property. The 10 minute drive to town provided just enough seclusion from the cruise ship crowds. Great place, very clean and pretty!!! The only things I would change is put a cushy toper on the bed to make is softer and make the TV's in the bedrooms work. We had a phenomenal time in Cozumel. The Condo was very nice, the beds were a bit hard for our taste but overall the condo was fantastic. Located South of town, away from cruise ship patrons and crowds. You will need a rental car, be sure to get the insurance. We highly recommend the cook, the meals were phenomenal, well worth price. The pools were very nice, the beach did not offer much snorkel opportunity, but plenty down the road. Most dive boats pick up at the dock, very convenient. Go ahead, splurge! We seem to get pretty much nothing but praise about the units we manage at the Residencias Reef. With reason, we like to think. That beach and that view are great. And as you noted, the cook service is great. Our cooks are people who have been taught to cook genuine, traditional foods and love preparing food for our guests. We would be delighted to stay at the same condo next year. There was a little problem with hot water, but the staff was very responsive when it was brought to their attention. The 3 ring binder at the condo had lots of useful information about taxi rates and car rentals. The pool and beach were beautiful and quiet. would love to go back...perfect location, but somewhat limited for dining nearby if you don't want a cook or to cook! That was the only real issue! clean updated condo with convienient location near beach club. we were able to be picked up for scuba at the nearby dock. the beach club food was delicious. having groceries in the condo upon arrival was great. The only complaint i had was that it was too far away from everything, and taxis were very expense, for our family of 5 they charged us 25$ usd one way. So we rented a car, otherwise you felt stranded there. - Nearby properties you might be interested in. Residencias Reef 6240 Amazing views from wraparound balcony! The Residencias Reef Condominiums on Cozumel are located right on a sandy beach. THIS ONE IS ON THE GROUND FLOOR JUST STEPS FROM THE POOL, FREE LONG DISTANCE AND INTERNET! 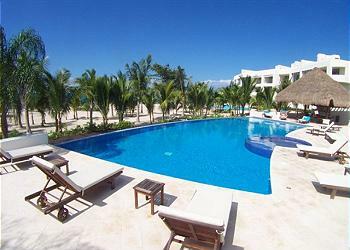 Residencias Reef 7160 San Francisco Beach.Great Rate! 2 Pools. 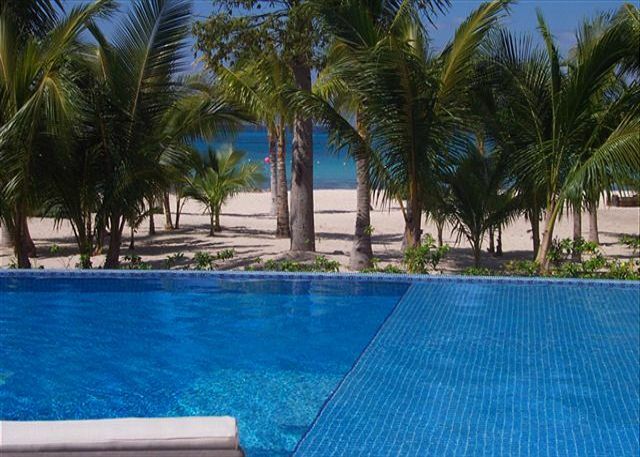 Residencias Reef 8380 Romantic, beautiful one bedroom getaway in paradise! Enjoy The Luxury Of a Private 3 BR-3 1/2 BA TownHome! 100 yds to the ocean from this beautifully appointed, luxury townhome. Coming soon - - -.